I know Saturday was the Grand National & Sunday is the boat race but it seemed racing wasn’t confined to those sports – the starting gun had gone off here too. Dozens of boats all hurtling along – not one doing the “slow for boats – idle speed”, all in a rush to get somewhere. Well, we stayed put. We’ll toddle off on Monday. A few chores need doing and then we walked back to Braunston for a beer. We tried the Plough, hmm Doom Bar, Hobgoblin or some Derby Bitter – which we tried, not bad but not good enough. TV on loud but no one watching – not a great welcome. 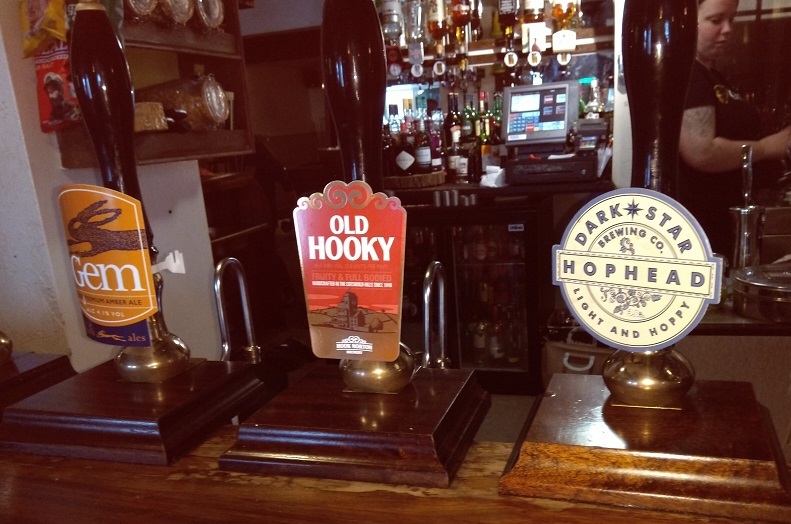 We moved on to the Wheatsheaf and lo, our eyes popped – Bath Gem, Hook Norton Old Hookey and Dark Star, Hophead – hmm, much better! Remind me not to drink three pints at lunchtime, for the rest of the afternoon flew by! The sun did peep out briefly and fed the batteries a few amperes but it rained around four and so that was that. Nice a warm though. Tomorrow is another day.